As Japan's Hayabusa2 spacecraft approaches the asteroid Ryugu, the probe has grabbed its best photos yet of the rocky body — and they'll only get better. The spacecraft, which launched in 2014, is set to arrive at the 3,000-foot-wide (900 meters) asteroid on or around June 27. After arriving, the probe will drop three rovers and a lander onto the space rock's surface to explore and grab samples. A rotating view of Ryugu captured by the Hayabusa2 spacecraft between June 14 and June 15, 2018. "When I saw these images, I was surprised that Ryugu is very similar in shape to both the destination of the US OSIRIS-REx mission, asteroid Bennu, and also the target of the previously proposed MarcoPolo-R mission by Europe, asteroid 2008 EV5," Makoto Yoshikawa, the mission's manager for the Japanese space agency JAXA, said in a statement on June 19. Bennu and 2008 EV5 are smaller and rotate faster than Ryugu, but they have simple composition, Yoshikawa added. "So, we have both differences and similarities that have combined to produce very similar shapes ... why is that? "So far, the asteroids we have explored have been different in shape [from each other], so Ryugu and Bennu could be the first time two similar-shaped asteroids have been examined," he added. "It will be interesting to clarify exactly what this similarity means scientifically." 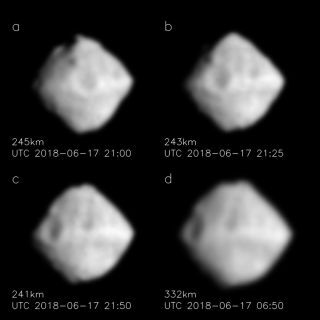 Raw images taken of the asteroid Ryugu on June 17-18, 2018, when the Hayabusa2 spacecraft traveled from 200 to 150 miles (330 to 240 km) away from the object. After its arrival, when Hayabusa2 will be just 12.5 miles (20 kilometers) above Ryugu, the probe will drop a small lander and three rovers between September and next July. The spacecraft will also hit the asteroid with an impactor, creating an artificial crater and then descending to collect material from below the surface that this crater reveals. Then, the probe will head back to Earth, arriving near the end of 2020 bearing samples for analysis. But all that work depends on correctly mapping the asteroid now, so scientists can choose the best places to land, the researchers said. "If the axis of rotation for Ryugu is close to the vertical direction in this image, there is a big advantage, as it will be possible to know almost the entire appearance of Ryugu at an early stage after arrival," Yoshikawa said. "This makes the project planning easier. "However, it is also possible that potential landing sites may be limited to the equator of Ryugu," he added. "I hope we can find a suitable place to set down the lander and rovers."